CutMaster +Dyneema is a glove, with the high resistance to cuts and punctures. Cut Level 4 Protection, with excellent wet grip - thanks to the micro nitrile-foam coating. Wenaas are the Norwegian Safety Experts. We don't believe you'll find a better priced Cut 4 glove, certainly not with the Wenaas brand. 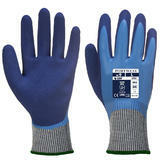 Wenaas Odin 6-6611 Cut Master Plus glove compliant to EN 420 and EN 388 4.4.4.2 standards. Conclusion: This is a brilliantly dexterous Cut 4 protection glove, affording the highest level of certified CUT protection. Reflex® K Plus is a knitted para-aramid liner with a crinkle latex palm coating. Kevlar provides protection against cuts, slashes and abrasion. Cut resistant para-aramid lining provides protection from cuts and sharp objects. The crinkle latex palm coating as well as providing excellent tear and puncture resistance. Heavy duty performance provided by durable latex coating. Elasticated knit wrist, makes it very comfortable especially in prolonged use. Ideal in both wet and dry conditions for safe and secure handling. Seamless knitted Kevlar liner is extremely comfortable. The latex coating is very flexible minimising hand fatigue in prolonged use. The protective properties of the Reflex® T Plus make it perfect for use in industries where safe handling and good cut protection is needed. Polyco Reflex TPlus General Purpose Glove conforms to: EN 388 3.4.4.4 standards. Protects the hand in damp environments or against aggressive detergents or alcohols. A flexible easy-maintenance grip glove with a latex coated palm. It provides protection against cuts with excellent durability. Greater hygiene - Breathable back of hand to reduce perspiration. Designed for easy movement and continuous wear, with no irritation by seams in contact with the skin. Showa GP-KV1 Kevlar Grip Cut Resistant Glove conforms to: EN420 Cat.2 EN388 3.4.4.4. safety gloves standards. Polyco Nemesis is a leather glove with a cut resistant seamless knitted liner providing excellent mechanical protection. Polyco Nemesis offers the user a high level of protection and handles well in both wet and dry conditions. It also offers good cut resistance and absorbs perspiration. The elasticated wrist on these safety gloves also ensures a secure fit keeping hands free from dust and debris. These heavy duty Kevlar gloves are designed to be durable. Provides the user with superior grip in wet and dry conditions. The seamlessly knitted liner enhances the overall user comfort. With the addition of nitrile, users have better sensitivity. 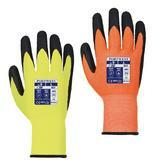 Showa KV2R Cut Resistant Gloves conforms to: EN388 4.4.4.3 & EN420:2003 safety standards. Kevlar knitted gloves with neptune coating. Constructed from high-tech Kevlar® para-aramid short fibres. The seamless construction does not irritate and the use of short fibres offer extra comfort. Exceptional cut resistance with dexterity. Provides superior mechanical strength and durability. Highly cut resistant, offers exceptional comfort and dexterity. Designed for optimum productivity and safety. Ansell 70-335 Kevlar Neptune Glove conforms to EN388 1.4.4.X and EN407 safety standards. Ideal for areas where a high level of cut resistance is important or where protection from heat is required. The materials used to make the glove offer a very high cut resistance to weight ratio. The use of Terry loop technique enhances heat insulation. The resulting thicker-walled glove offers high shock absorption without losing dexterity. Constructed from high-tech Kevlar®, these gloves give improved touch sensitivity and fit. The seamless assembly avoids any irritation and the use of short fibres offer extra comfort. The reversible design allows the glove to be worn on either hand, avoiding replacement costs. Ansell 70-215 Neptune Kevlar Glove conforms to: EN388 1.4.4.x., EN407 x.1.x.x.x.x. hands protection safety standards. The HyFlex® 11-501 glove features Intercept Technology® jointly developed by Ansell and DuPont. The exclusive DuPont™ Kevlar® Stretch Armor provides all-day comfort with ANSI Level 4 cut protection. Combined with a lightweight, ergonomic design, it gives workers the natural fit, safety and dexterity they need when working with sharp materials. Nitrile foam coating enhances light oil grip, solid dry grip and tactile sensitivity. The HyFlex® 11-501 glove is also resistant to heat, allowing for versatile use. Ansell 11-501 HyFlex Cut Resistant Work Glove conforms to: EN 388 3.4.4.1 EN 407 X1XXXX standards. A lightweight glove with a cut resistance level of 4. Excellent grip in both wet and dry environments. High resistance to abrasion and tear resistance. Fits comfortbaly with the user. Abrasion, Cut, Tear and Punture Grades : 4.4.3.2 . Kevlar Polka Dot gloves provides exceptional protection against cuts. These fingerless gloves grant protection whilst also maintaining the users dexterity. The rubber dotted texture provides superior grip in wet or dry conditions. Ideal fingerless glove to handle both large and small hazardous components. Beeswift Kflgmwd Kevlar Polka Dot Fingerless Glove conforms to EN388 1.4.4.X Safety Standards. 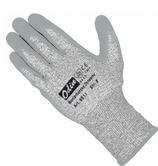 Polysafe® cut and heat-resistant heavyweight knitted aramid glove with cotton lining. 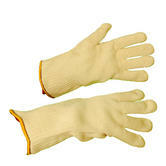 The original cotton-lined aramid glove and still the best-selling aramid glove today. This glove has been developed for the heavy industry where the risk of cuts and high temperature objects are a mayor hazard for your hands. This particular tread of Aramid fibres on a 100% cotton liner can withstand heat contact of 250º for 19 seconds without any harm for the user. It also provide a level 4 protection against cuts. The Liquid Pro Cut Gloves offer maximum liquid protection and a high level of cut resistance. The smooth latex is fully coated before a second latex foam palm dip is applied, this process ensures maximum grip. The Cut Level D/ANSI A4 liner provides excellent protection against high cut risks. 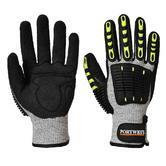 Portwest AP81 Liquid Pro Cut Resistant Work Gloves conform to: EN 420, EN 388:2016 3X43D standards. level of protection against Arc Flash burns and cuts. The 13-gauge knitted liner is manufactured with a unique flame-resistant aramid yarn which provides increased dexterity and hand movement. The flame-resistant neoprene coated palm allows for excellent grip. ARC Grip glove provides a high level of protection against ARC flash, burns and cuts. A flexible and robust fully coated nitrile glove to protect against water, grease, oil and abrasion with high cut resistance. The additional nitrile foam palm coating provides outstanding grip in wet and oily conditions. Hagane Coil® technology liner provides cut resistance performance yet allows freedom of movement as the hand flexes. Full coating of flat nitrile protects against water, oils, grease and abrasion. Nitrile foam palm coating provides optimal long-lasting grip in wet and oily conditions. Manufactured using SHOWA's patented hand former design for a comfortable fit and to minimise hand fatigue. Showa S-TEX 377 Cut-4 Resistant Work Gloves conform to: EN 388:2016 4.4.4.1D Cat. II standards. A comfortable and supple grip glove featuring excellent protection against cuts. Showa S-TEX GP1 gloves with Hagane Coil technology and a fluorescent colour for increased visibility in low lighting. Manufactured to Category 2, ISO 13997: Level D and EN388 2.4.4.3 Safety Standards. SHOWA's patented Hagane Coil technology to provide excellent cut protection. Greater hygiene gloves with Antibacterial and anti-odour treatment, breathable back of hand to reduce perspiration. Designed for easy movement and continuous wear - no irritation by seams in contact with the skin. This Cut Resistant Thermal Glove has an added layer of TPR for maximum impact resistance and high flexibility. 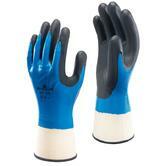 The nitrile micro foam palm gives superior grip and protection against liquids and water penetration. Ergonomic design for optimised comfort. Conform to: EN 420 EN 388:2016 - 4.X.4.2.C.P. EN 511 X.2.X. 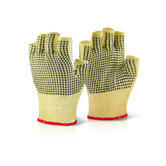 Ansell PowerFlex 80-600 glove is ideal choice for safely handling glass, plastics and metal. It offers superior comfort and exceptional cut resistance and robust overall mechanical performance. High EN cut protection level - 4 is achieved through the Kevlar knitted liner and natural rubber coating. Glove coating resists very well to abrasion, tearing and punctures. The Ansell PowerFlex 80-600 latex coating with crinkle finish gives the glove an excellent grip in both dry and wet conditions. 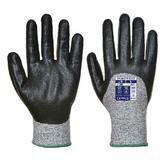 Silicone-free gloves prevent fingerprints on metalied warm insulation glass, no extra surfaces cleaning is needed. Ansell PowerFlex 80-600 Cut Resistance Kevlar Glove conforms to: EN 388 – 3.4.4.4 standards. The Polyco Nitron Plus gloves are heavy duty, nitrile coated on a Kevlar felt liner with nitrile safety cuff, general purpose gloves. Polyco Nitron Plus gloves offers excellent protection from abrasion, cuts, snags and punctures. 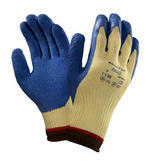 Please note that these gloves are designed to be a general purpose glove and are not waterproof or chemical resistant. Coating: Nitrile coating is highly resistant to grease and oil. Grip: The roughened finish provides good dry grip. Nitrile Safety Cuff: Provides additional protection to the wrist area. Polyco Nitron Plus, Heavy Duty, Kevlar Felt Liner Nitrile Coated, General Purpose Glove conforms to: EN388 Rating 4.4.3.2 . Supreme cut resistance combined with superb grip in oily conditions. ¾ nitrile foam dipping absorbs oil keeping hands clean and dry to ensure secure handling. CE certified Portwest A621 Cut Resistant Nitrile Foam glove conforms to EN 388 (4.4.4.3.D.X); EN 407 (X.1.X.X.X.X) and EN 420. Portwest A625 Vis-Tex Cut resistant glove with PU dipping for high abrasion resistance, the HPPE liner also achieves a level 1 for contact heat. CE certified Portwest A625 Vis-Tex Cut Resistant glove conforms to EN 388 (4.4.4.3.D.X); EN 407 (X.1.X.X.X.X) and EN 420. Flexible hi-vis lining for optimum protection and comfort. Knitted gloves designed to provide superior mechanical strength in light to medium-duty handling and production applications. The DuPont™ Kevlar® reinforcement provides a very high cut resistance, offers enhanced comfort and dexterity. Neptune® coating: glove fibres repel liquids, avoiding damage to the Kevlar® strands and extending glove life. Extreme resistance to cuts, splinters and burrs, the natural rubber crinkle finish gives the glove an excellent grip in dry and wet conditions. Excellent cut performance due to the liner construction, glove protects the wearer with a triple-layer construction comprised of steel, glass fiber and Kevlar®. Good heat contact resistance, gloves can be used for safely handle warm objects. Extra-long cuff offers extended safety for the forearm. Ansell Powerflex 80-658 Heat and Cut Resistant Glove conforms to: EN407 Level 2, and EN 388 - x.5.4.3 standards. Dexterity with superb cut resistance for optimal productivity and protection. The liners of the HyFlex 11-638 gloves have a yarn structure that offers high levels of cut resistance. Ideal work gloves for handling and assembly applications involving contacts with sharp pieces. The HyFlex 11-638 coating of the specific polyurethane dipping provides a secure grip on dry or slightly oily pieces. The Lycra in the liners as well as the polyurethane coating, provides excellent flexibility and comfortable fit. The PU formulation also increases abrasion resistance on the glove's work surface. Ansell HyFlex 11-638 Cut protection gloves conforms to: EN 420 and EN 388 4.4.4.3 hand protection standards. You know to expect a high level of cut protection. These Cut 4 gloves typically use kevlar or dyneema woven to allow skintight flexibility along with cut 4 blade protection. The best value cut 4 protection glove is the Polyco Nemesis 897 Cut 4 Resistance which is a white leather gloves with a vein guard and cut 4 protection. Our favourite is the Skytec Ninja X4 which is made from nylon but dipped in a bi polymer coating. It has actifresh and an open back to prevent sweat and bacteria build up. Gloves suitable for many different tasks - General Handling Gloves. Working with electricity - Electrician Gloves. Welding gloves - Heat-resistant gloves.